Raising children and keeping your sanity is all about perspective! 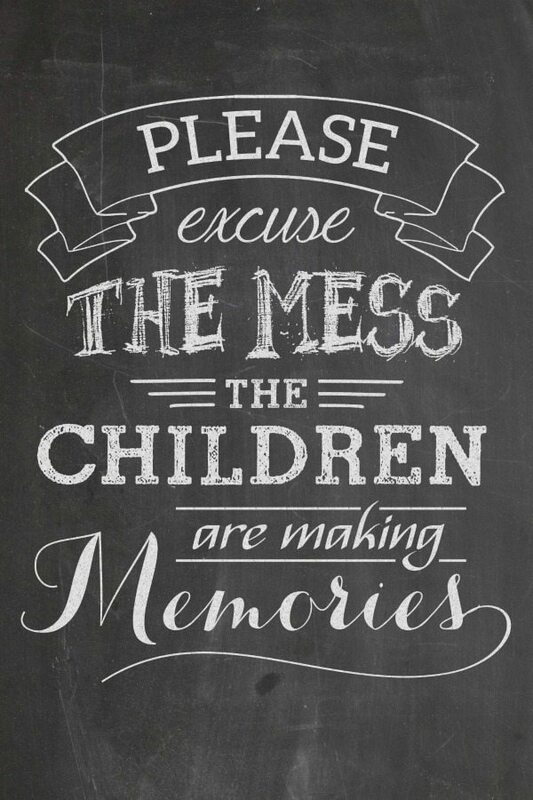 Download this free Excuse the Mess Chalkboard Printable to remind yourself and guests what’s truly important. I love chalkboard printables, there’s just something about them that I’m crazy about right now. (You may have noticed that I’m kind of crazy about printables in general!) This one is a great reminder for parents to leave to worries of housework for later – sometimes you just need to get down on the floor and play with your children. Sometimes the laundry and dishes have to wait. Sometimes the toys need to be all over the floor. Sometimes the only thing to do is make a giant tent with every blanket in the house. Sometimes, it’s ok to just let things be messy, and have fun. This is something that I’ve often struggled with as a parent, but that I’m trying to do better with… my children will only be this exact age today… and someday I won’t remember the mess, I’ll just miss their little smiley faces peeking out of a ‘cave’ they’ve made with every blanket in the house. I’m sharing this printable over at Busy Mom’s Helper, so click the link above to download this FREE chalkboard wall art print now! You can take it to your local copy center to be printed, then pick up an inexpensive frame.